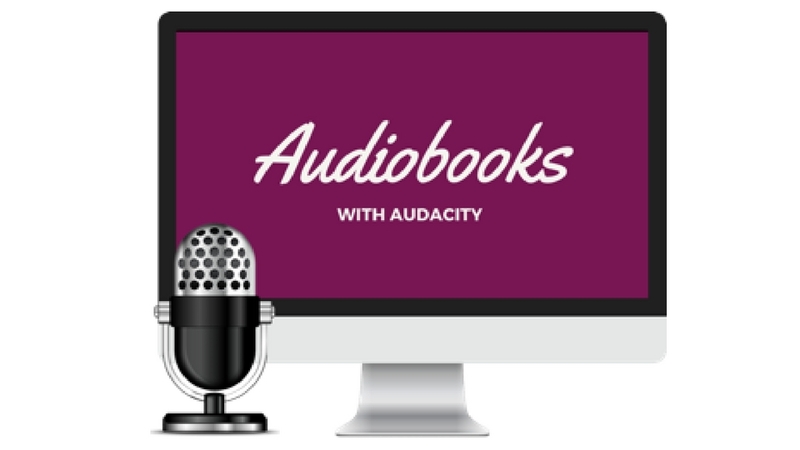 A step-by-step online course for recording, editing, & mastering audiobooks in Audacity. Course enrollment + 50% discount ends on Thursday night @11:59pm EST. You'd like to earn extra income from home doing something fun that you actually enjoy. But you need flexibility and the ability to work at your own pace. You're creative and love the idea of recording audiobooks in your free time. But you're excited and willing to learn a new skill that will be in high demand for years to come. What if you had a set of proven step-by-step instructions that made it easy to learn this skill and achieve your goals? Audiobooks with Audacity walks you through you the exact process that I've used to successfully prepare, record, edit, and master dozens of audiobooks to ACX specifications using the free audio recording program, Audacity. Instant access to 15 video based modules that take you from absolute beginner to successful audiobook narrator with titles on Audible, iTunes, Amazon, and more! Lifetime access to all course videos and materials. Self-study lessons that let you learn at your own pace. Technical tutorials that show you each step you need to take to complete your audiobook in Audacity. Quizzes, checklists, and templates to keep you on track. Learn why right now is the best time to learn the skill of audiobook narration. Get the truth about the equipment and training that you need to get started. Find out where your audiobooks will be sold and the major players in the audiobook industry today. Find out about the different roles and specialties you can take on in the audiobook industry as a freelancer working from home. Learn how to offer single services like editing and proofing or how to find an assistant to outsource these tasks to if you want to focus on vocal performance. You'll learn about the best place to get started and find work as a new audiobook narrator. Learn about alternative and advances strategies for finding a nearly endless supply of audiobook projects to work on. Learn the difference between PFH, Royalty Share & Stipend payments. Get guidance on how to set your own narration rates and what factors to consider before entering into a royalty share deal. Get step-by-step instructions for setting up your account, recording samples and submitting auditions. Learn how to search for books that are a good fit for your voice. 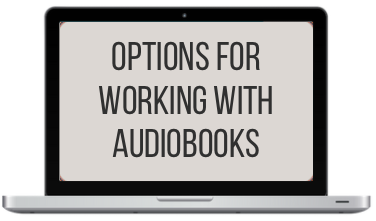 Learn how this alternative audiobook submission site works and how it's different from ACX. Get the facts on AR audio submission requirements. Find out how to work with authors who want to submit through Authors Republic. Find out which audio technical specifications are universal among most audiobook submission sites. Get an in-depth walk through of ACX's submission requirements. Get equipment recommendations that fit almost every budget. Learn how to set up a DIY recording space in your own home. Tutorials and "tests" for judging if your chosen space will produce high quality audio. If you're new to using Audacity, these tutorials will walk through everything from getting set-up to downloading essential free plugins. Learn how to use Audacity's basic functions. Get a walkthrough of the advanced tools that effects that we'll use in the editing and mastering tutorials. Find out how to prepare your manuscript BEFORE you start recording. Learn my signature character highlighting method. Get advice on creating different character voices and personas. Get my step-by-step pre-recording process that covers mic setup, adjusting your recording volume, and an Audacity settings checklist. Learn two different recording techniques for dealing with mistakes while reading. Learn how to remove mistakes and outtakes from your recordings, fix spacing issues, and eliminate pops and plosives. Step-by-step tutorials for inserting roomtone and re-recording segments. Learn when proofing for mistakes should be done. Get my step-by-step proofing process and a proof table template to record mistakes while reviewing your work. Learn the three key numbers that your audio must meet to satisfy ACX requirements. Find out how to test your sound levels. Get troubleshooting advice for correcting single levels. Learn how to prepare your files for retail by creating your retail sample, recording credits, and exporting your Audacity audio files to MP3 format. Get an overview of the ACX review process and what to do if your audio gets rejected. Learn what happens next and how to keep track of sales and payments. Krystal Wascher is an author, audiobook producer, and attorney. She has been producing audiobooks since 2014 when made the bold move to leave her corporate legal job behind to pursue her interests in writing, audio production, and digital media. Since making the leap, Krystal has written three books, produced more than 50 audiobooks, and has taught more than 10,000 students around the world. Her work has been featured in Entrepreneur, The Podcast Success Summit, and the Book Marketing Summit. She's also bee featured on numerous podcasts such as Zen Courses and Entrepreneur 360. "I've noticed that a lot of people stay stuck in jobs and situations that don't really serve them because they don't know that there's an alternative. My goal is to show people that there are amazing opportunities available to them regardless of their age, financial situation, network, level of education or background. I love being able to teach people skills that make a real impact on their lives and level of happiness." 1. When will I get access to the course? You get access to all of the course video lessons and materials as soon as you enroll. 2. How long will I have access to the course? 3. Do I need to be tech savvy to take this course? No. It's great if you have basic computer skills, but you'll learn everything that you need to know within the course. 4. I'm already pretty tight on time. How much time do I need for this? The course is completely self-paced so you can work through it when it fits into your schedule. If you're short on time, you can skip straight to the recording and editing tutorials and reference the introductory modules as needed. 5. Do I need an acting background or prior experience to do this? No. While acting skills can be helpful, they are absolutely not necessary to start narrating audiobooks. 6. Will I need to spend a lot on equipment? No! I teach you how to create high quality audiobooks using the FREE software program, Audacity. While a higher quality microphone will make your recordings sound better, you can get started with low cost equipment or find deals on sites like eBay and Amazon. I never recommend that people spend a lot on equipment until they've decided that they want to pursue narration longterm. 7. What if I don't like the course or it doesn't work for me? My goal is to create the most effective audiobook training program in existence, but if you're not happy for any reason just send me an email within 30 days of enrolling and I'll refund 100% of your purchase. Have more questions? Shoot an email to help@krystalwascher.com and I'll get you an answer right away. No waiting around for months trying to figure out technical audio terms or how to actually make your recordings sound professional in Audacity. With this course, you can avoid the confusion and frustration that many new narrators face, save time, and start creating audiobooks right away. I'm sure that you'll love the course, but in the event that you're unhappy for any reason, just send an email to help@krystalwascher.com to request a refund within 30 days of purchasing the course.